Q: I want to resize all the pictures in one folder from 2400pix x 3600pix down to 900pix by 1200pix. Instead of resizing one by one which will take forever to cover the whole folder, is there any "action" like in Photoshop to do batch resizing? A: Yes there is. Start by creating a new folder on your Desktop (or wherever you want your finished photos to be) and name it something like Done. 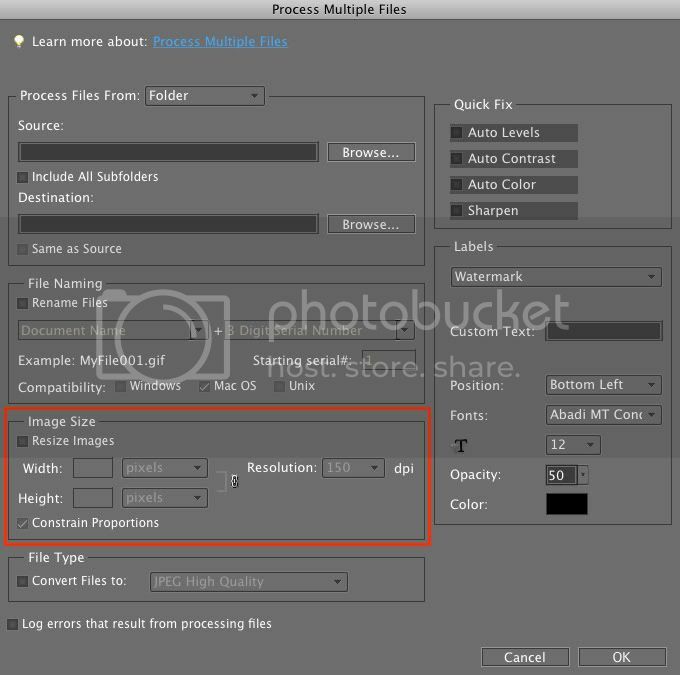 Go up to the File menu and choose Process Multiple Files…. A dialog box will appear. In the top/left click on Browse… next to the Source field and navigate to the folder where you have the photos that you want to change size for. Now click on the Browse… next to the Destination field and navigate to the Done folder you created on your Desktop. Go down to the Image Size area (outlined in red in the picture below). Click on the Resize Images box and enter your Width and Height into the appropriate fields (you may have to uncheck Constrain Proportions to be able to enter the size you want. Choose a dpi from the Resolution field. Click OK to process your photos. I hope that helps Sinh_Trinh.